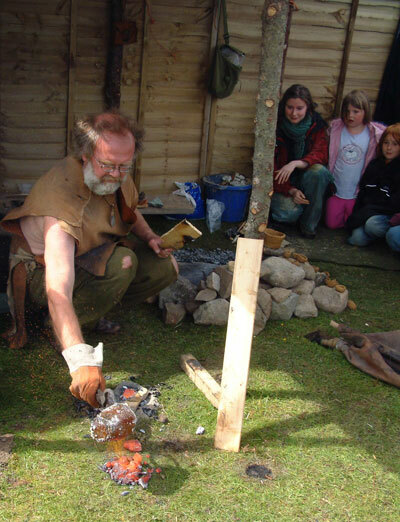 The weather may have been unsettled, especially on the Thursday and Sunday, but Mark Keighley and Orlene Mcilfatrick provided some excellent demonstrations of prehistoric bronze casting and pottery manufacture. Mark is based at Archaeolink, while Orlene is currently studying for her PhD at the University of Edinburgh. Prior to his visit, Mark had sent through instructions regarding the erection of a small shelter and for a furnace. The furnace (shown above) was manufactured from local clay. To start, a good-sized hole was excavated into the ground, along with opposing slots to take the bellow pipe. 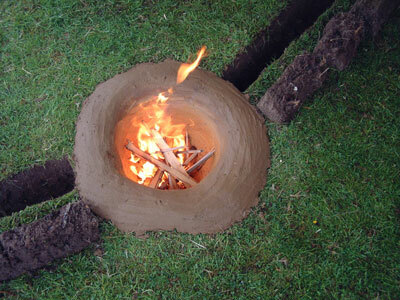 The hole was then lined with a clay lining around 50mm thick, complete with the two holes to take the bellows. The reason for two bellow holes was to allow adjustment for wind direction. After construction, a series of ‘cold’ fires were lit in the furnace to slowly dry out the clay. 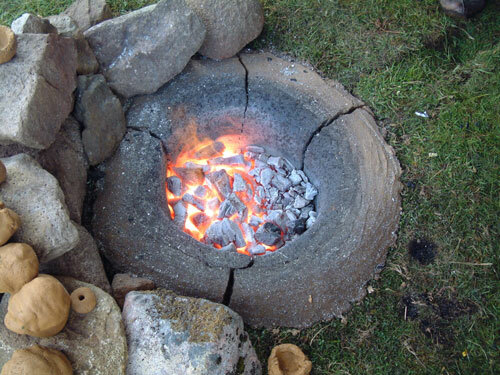 To save on the preparation of charcoal on site, we purchased some good quality lumpwood charcoal, while Mark brough along a stone mould for a flat axe, skin bellows, clay crucibles and other raw materials. 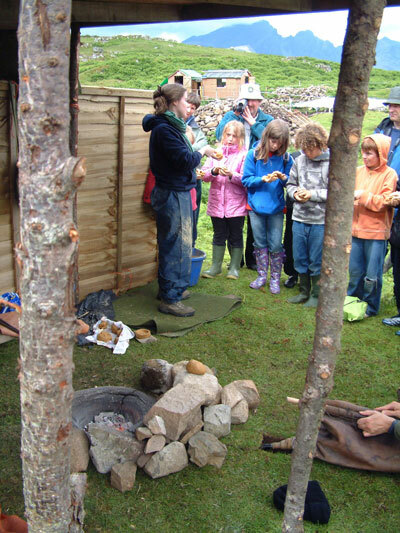 On the Thursday and Friday we hosted visits from Plockton, Elgol and Broadford Primary Schools. 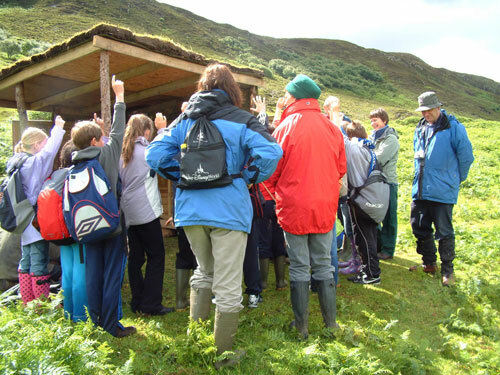 The pupils and teachers were first shown around the High Pasture Cave excavations, before they were introduced to prehistoric pottery manufacture using a local clay. The children made their own small pots, while Orlene showed the various techniques used in manufacture and in decorating the finished pots. We hope to fire some of the pots manufactured during the demonstrations during open days in 2009. 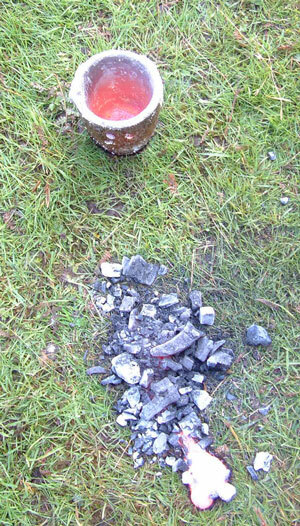 Meanwhile, Mark had lit the furnace, loaded this with charcoal and set the crucible containing copper and tin in the centre. This was allowed to burn for around one hour before the bellows were activiated. Mark was grateful for the volunteers who undertook this task, as the bellowing could take up to one hour of steady, rythmic pumping! 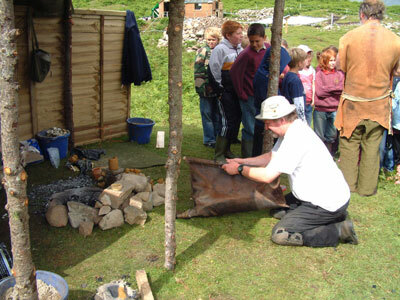 This allowed Mark to show the school pupils, site volunteers and visitors to site replica bronze tools and weapons, while he also explained about the processes involved and the potential role of metalworking during prehistory. Mark managed to get two castings in each day on site and the bronze casting in general proved a valuable experiment for all concerned. During one of the casts, Mark thought that we had achieved temperatures approaching 2200 degrees Celsius in the furnace - almost too hot for the bronze - proving that the furnace design was efficient. We hope to get Mark and Orlene back on site in 2009, along with John and Val Lord, providing a broad spectrum of experimental archaeology spanning the Upper Palaeolithic to the Iron Age. The High Pasture Cave Project Team would like to express their heartfelt thanks to Mark Keithley, Orlene Mcilfatrick and Susan Walker, for helping to make the open days so successful. Travelling to Skye each summer I would like to know where to find the high-pasture-cave. Coördinates or position on a map would be very helpful.